German artist who lives on the Spanish Island Majorca. After her studies she was travelling for a long period through North and South America that gave her a better understanding of the diversity of culture and environment. In this special time of her life she also took classes at different artist studios till she found her own style of painting. Important places for her were Mexico, New York and especially Montreal in Canada, where she lived more than 3 years. Once back to Europe she finally found the right place to settle down on this Mediterranean Island Majorca, where the sea, the light and the warm climate animates her to create these bright and light-flooded paintings. Her style is somewhere between abstract and figurative, depending on how far the imagination of the viewer is willing to find his own meaning within the work by looking inward the layers of paint that are put, scratched away and are put back again. A game between showing and hiding parts of the paintings history. "Usually I paint with spatulas and sponges. I love to lift lower layers of paint by sanding and scratching the surface to discover a figure - some female shapes. This is the moment when the painting gets alive and it tells me a story." 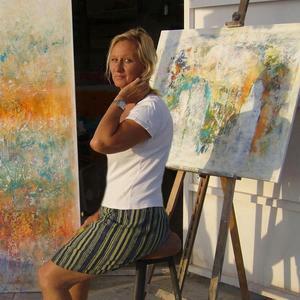 Doris Duschelbauer took part in International exhibitions. Her work is in private collections in New York, Canada, Norway, Germany, Switzerland, Spain and Austria.